If you want to know whether or not All-Clad’s Copper Core cookware is worth it, I can’t answer that for you. 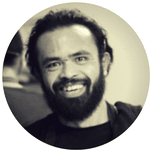 I don’t know what your budget is, how often you cook, or how serious you are in the kitchen. All-Clad’s Copper Core line is pretty expensive, and while I think it’s one of the finest cookware sets you can find, period, that won’t magically put enough money in your bank account to comfortably afford a full set. What I can do, however, is justify the cost. Over the course of this article, I’ll do my best to explain why the All-Clad Copper Core line is so special and why I think it’s such a good set. All-Clad cookware has a fantastic track record when it comes to durability, meaning that while the Copper Core pots and pans are quite expensive, there’s a pretty good chance they’ll last you for a couple decades. This means you may never need to buy another cookware set again. While the Copper Core set is quite expensive, there’s a pretty good chance it’ll last you for a couple decades. If you’re only going to get a single piece of cookware, this saute pan is a perfect way to try out the Copper Core line. As a set, Copper Core comes with either 7, 10, or 14 pieces. It’s an all-metal cookware line, with metal handles and lids. As a luxury line, it’s got several inclusions that aren’t necessarily standard in All-Clad cookware. This includes rolled rims (for effortless mess-free pouring) and rounded handles that have a nice indentation for your thumb. This gives you increased control when moving a pot or pan from burner to burner. 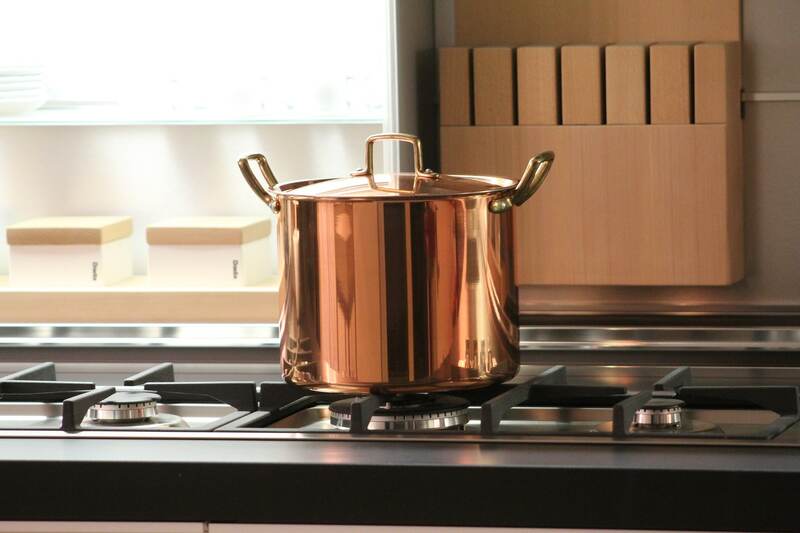 Like the D5 or MC2 lines, Copper Core is oven safe to 600 F. The exterior of each pot and pan is made from magnetic steel (for induction capability) while the inside features a smooth stainless steel cooking surface. This makes cleanup fairly easy. 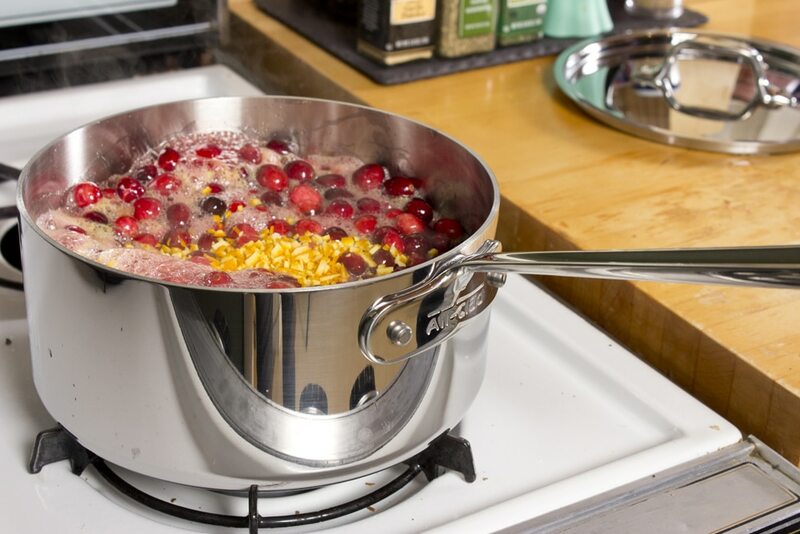 It does take a bit of practice to keep foods from sticking on a stainless steel pan, but the incredible thermal handling of the Copper Core line makes this a bit easier than with other pots and pans. The word “thermal” is going to come up a lot later on down the page. For now, let’s just say that the Copper Core pots and pans heat up better than pretty much every other set of pots and pans on the market. They’re quicker to hit the temperature you want, the heat spreads evenly throughout the whole pan, and they’ll cool down quickly when you remove them from the heat. 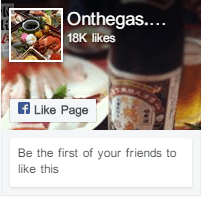 In other words, they do pretty much everything you want. One feature of All-Clad’s pots and pans that might be viewed as a downside is the way the handles are riveted. Sure, the solid rivets mean that your handles will stay attached to your pots and pans for practically forever, but there’s an argument to be made that screw-on handles are actually better. See, when you have a pot or a pan for many years, cooking gunk will try to accumulate between the handle and the pot or pan. You can clean this out with the right tools and a bit of dedication, but it’s still somewhat hard to get everything totally clean with a solidly attached handle. Screw-on handles can be unscrewed, letting you clean everything quite easily. While you have to tighten the screws occasionally, this isn’t a big deal for anyone who owns a screwdriver. To be clear, this is a pretty minor issue. There’s certainly something to be said for having a handle that’s solidly attached to each pot and pan. The Copper Core set is built to last for many, many years, and the riveted handles are a testament to that ideal. All-Clad doesn’t want you to have to worry about maintenance, ever. In order to understand why the Copper Core line is so exceptional, it’s necessary to understand how bonded pots and pans are made. Let’s quickly go over the construction of modern cookware and talk about how different materials affect the finished product. All-Clad was one of the pioneers in the world of bonded cookware. The name “All-Clad” refers to the fact that the whole of their pots and pans, not just the base, uses this construction method. 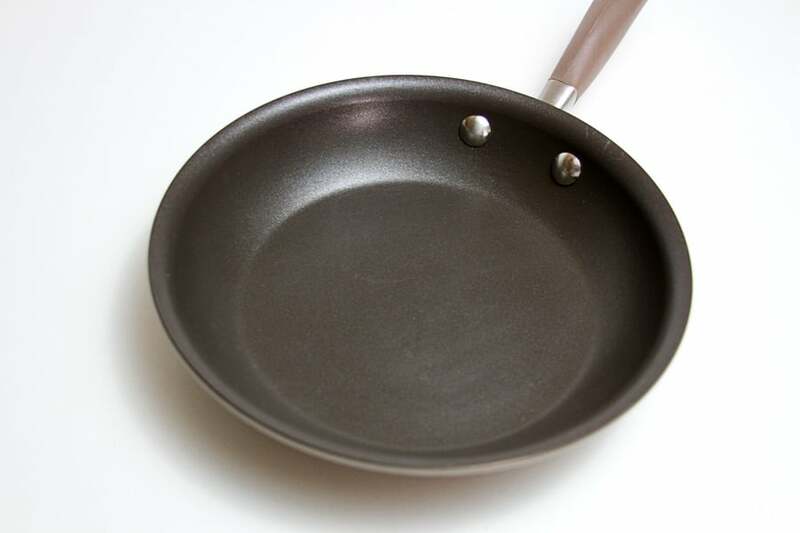 Bonded cookware consists of a core of thermally conductive metal (usually aluminum) with stainless steel on the inside and often outside of the pan. This process helps give consumers pans with the best combination of durability and performance. Aluminum has excellent heat transfer, meaning that it takes heat from your burner and transfers it to your food very quickly. On the other hand, it’s fairly soft and isn’t a particularly good cooking surface (unless it’s treated, which is a different story). Steel is very durable and nearly completely non-reactive, meaning it’s safe to cook acidic foods on a stainless steel pan. It’s pretty hard to scratch and can be cleaned off easily with just regular soap and water. Its downside is that it’s not very thermally conductive, especially when compared to aluminum. Let’s talk specifics. Aluminum transfers about 130 Btu (British Thermal Units) per hour, degree difference in Fahrenheit, and foot of material. This is a complicated unit (Btu / hr F ft) due to the way heat transfer works: you need to know the surface area, the length of time two materials are in contact, and how hot they each are. A three thousand-degree stove will heat things up much more quickly than a three-degree stove. Steel, by contrast, transfers somewhere between 7 and 26 Btu / hr F ft. This is a lot less than aluminum. It’s five times worse at BEST, going down to about 19 times worse in a worst-case scenario. Remember that surface area, temperature difference, and time are going to be fairly constant from pan to pan, meaning that we can compare these numbers pretty directly. All-Clad’s Copper Core line utilizes a core of copper (as you might expect). So how does this compare? Copper transfers about 220 Btu / hr F Ft at normal cooking temperatures. This means it’s about 70% better at transferring heat than aluminum. This is a pretty significant difference. Now, the Copper Core line isn’t entirely made from copper. Instead, it uses a generous copper layer that’s sandwiched with aluminum in between layers of steel. This is for two reasons: one, to keep costs down (since copper is expensive) and two, to keep weight down (since copper is also very heavy). 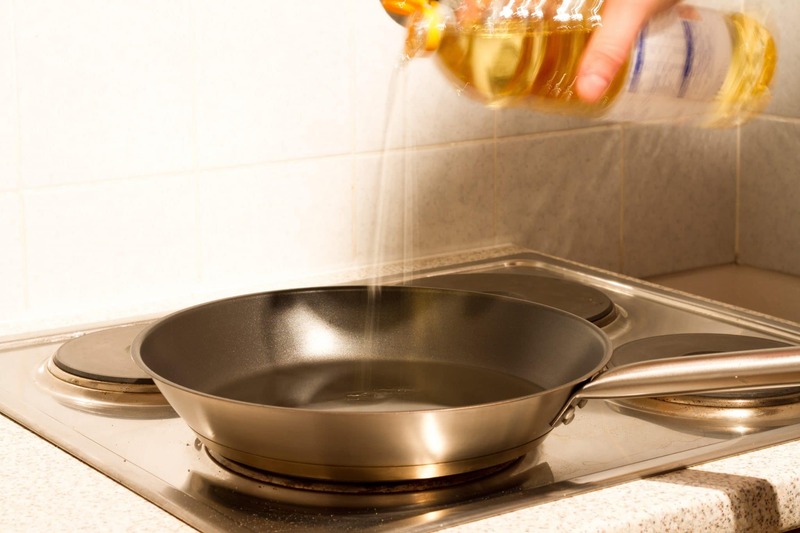 While this means that heat has to also flow through layers of aluminum and stainless steel, you can still expect a noticeable reduction in the time it takes your pots and pans to heat up. It’s not uncommon for water to boil thirty seconds faster in a copper core pot. 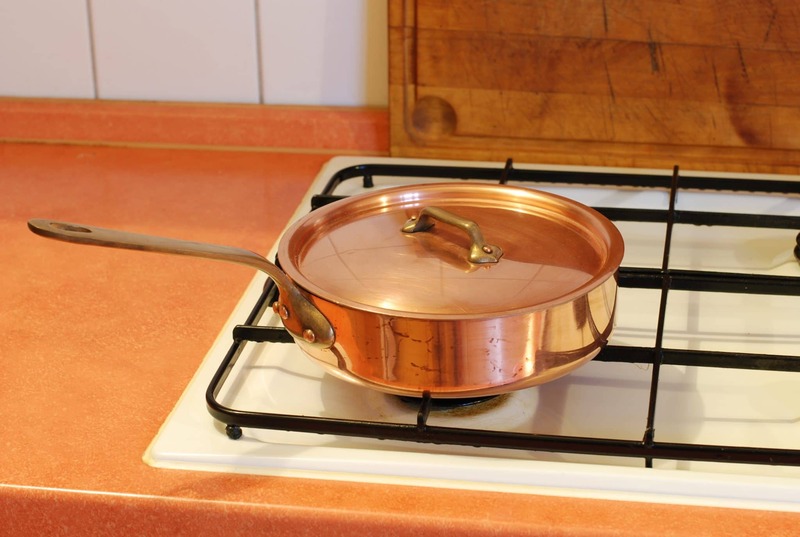 Copper also helps your pots and pans cool down, which is essential when it comes to maintaining an exact temperature. This means that copper pots and pans are the go-to cookware for candy making. All-Clad’s Copper Core line isn’t designed specifically for boiling sugar, but it makes pretty nice candy cookware when you’re so inclined. Do I Need Copper Core? To be totally clear, the difference between Copper Core cookware and another All-Clad set (like MC2 or D5) isn’t huge. Again, you’ll see a reduction in the time it takes to boil water and you’ll find it somewhat easier to control the temperature of your pots and pans. That said, most of cooking isn’t heating up the pan — it’s heating up the food. As far as this vital process goes, there isn’t a huge difference between a Copper Core pan and an MC2 pan. I mentioned earlier that All-Clad’s Copper Core cookware has some nice features that are designed for the discerning chef. The rolled edges and stay-cool concave handles aren’t standard in All-Clad cookware. This makes the Copper Core line one of the smoothest sets as far as kitchen handling is concerned. One other big upside to Copper Core is the inclusion of a visible ring of copper around the outside of each pan. This visual signature makes your cookware look very appealing. It’s a unique mark that helps the shining exterior of each pot and pan exquisite. One of the big benefits of choosing All-Clad is the branding and visual appeal of the products, and Copper Core is perhaps the best-looking set. Of course, as I mentioned earlier, the biggest advantage of Copper Core comes from thermal handling. I’m not an engineer, but my math seems to indicate that the inclusion of merely 15% copper should make pots and pans heat up 10% faster. Even a small difference in heat transfer can help reduce the time it takes water to boil and make controlling the temperature of your pots and pans much easier. While copper offers incredible thermal handling and unique good looks, it’s not the easiest material to care for. All-Clad’s Copper Core line sidesteps this issue by keeping the copper locked away safely between layers of other metal. Nevertheless, there’s an exposed ring of copper around the side of each pot and pan and a bit more visible in the very edge. Caring for this is simple: all you need to do is wipe it down occasionally with a special copper cleaner. The product you buy will have instructions for its use. Otherwise, however, you’re fine to clean your pots and pans normally. The copper ring will lose its shine and look somewhat drab, but you can always take your specialty copper cleaner and polish it to return its luster. I like to recommend a lidded saute pan like this if you’re only going to get a single piece of cookware. The tall, straight sides and the inclusion of a lid mean that you can cook liquid-heavy dishes like stews, soups, and even rice and pasta in this pan. On the other hand, the generous amount of flat surface area allows you to sautee, fry, and toast food just fine. This means that you can use this pan for just about every dish you can think of. It’s a perfect way to try out the Copper Core line. Otherwise, this pan is identical to the products you get with the full set. It’s got the same 5-layer construction, the same helpful inclusions (like the carefully constructed handle and rolled edges for easy pouring), and the same excellent longevity. Of course, you can also pick up a different individual piece if you’d like. This pentola is specially designed for cooking pasta. It’s got an insert with holes that makes it easy to steam food or drain pasta, while the copper core construction helps you boil water quickly. Other options include this saucier pan, which lets you take full advantage of the excellent heat control Copper Core gives you. You’ll be able to precisely control the simmer of your sauce with this pan, giving you extra options with your favorite dishes. One of my favorite features about All-Clad is that they don’t mess around as far as durability is concerned. Each All-Clad pot and pan is built to last for a very long time. All of their stainless-steel cooking surfaced pots and pans are covered by limited lifetime warranties. While All-Clad stands behind their products, the more important thing to me is their excellent track record. All-Clad pots and pans have been around for several decades, and you don’t have to look too hard to find people who have owned their All-Clad cookware for more than one generation talking about how well their original set has held up. What this means is that the Copper Core set will last in your kitchen for quite a long time. This isn’t a non-stick set you’re going to throw away in three years. Instead, it’s an investment into your future. You’ll have lots of fun using these pots and pans for many years to come. Is All-Clad Copper Core Worth It? Ultimately, while I think Copper Core is one of the best cookware sets available, it’s still pretty pricey. This means that the ultimate factor that decides whether or not the set is a good purchase is your budget. If you simply can’t afford the Copper Core set, be sure to consider cheaper All-Clad options like MC2, D5, and Tri-Ply. You still get the excellent durability and quality of All-Clad. Wolfgang Puck Cookware Reviews: A Solid Celebrity-Endorsed Set?